I was watching FoodTV on the weekend and saw this recipe that I thought I would share with everyone. It completely fits with the theme of this site and involves jalapeño peppers, which I love. I would suggest replacing the mayo with cream cheese or cottage cheese. Try these out at your next backyard party as an appetizer. They are fast easy and fun. Everyone will love you for it! Cut the peppers in half lengthwise and remove seeds. Mix the cheese, mayo, onion, celery, and Worchester sauce together. Take this mixture and fill the peppers. Press down on each top to flatten. Chill in the fridge for 20 minutes. 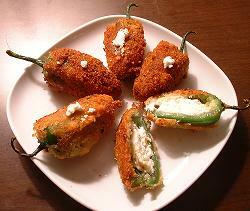 Roll each pepper in the beaten egg, and then dredge in breadcrumbs to coat. Place on a baking sheet. Bake at 350 degrees Fahrenheit (180 degrees Celsius) for 10 to 12 minute, until tops are slightly crisp. « Start your own micro-brewery for only $5,000!